I now have a site on Etsy for my new thing- Damn Good Doormats! I believe the entrance to your home should reflect the individual person inside. My 100% coconut fiber doormats have a latex backing keeping the mat firmly in place. 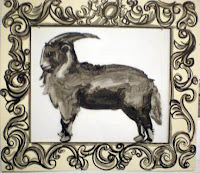 Every one is hand stenciled with exterior latex paint and finished with a coat of polyurethane for wear resistance. They are air pressure sprayed, not spray paint! Longer lasting and better for the earth. Whenever possible, my paint is salvaged keeping our landfills latex free. Unless otherwise noted, all mats are 18" x 24"
CUSTOM DOORMATS ARE AVAILABLE! 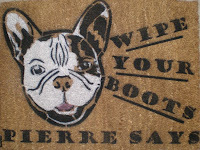 I can put your pet's name on the mat! 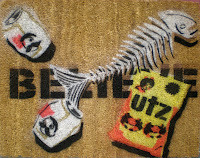 Out of Baltimore, these 100% coconut-fiber doormats are hand-stenciled with either a custom design, or existing action like a snarky homage to Baltimore's old “Believe” anti-drug campaign (empty beer can, crumpled bag of chips, fish skeleton), or a silver Michael Jackson glove next to “Beat It”, sure to be ignored by DC's many smooth criminals. 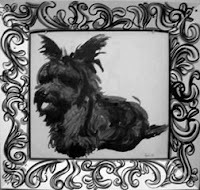 "Our true personalities are often reflected through our pets. The same goes for our President's Pets. 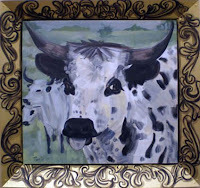 Bush Jr's favorite cow Ofelia has a carefree roguish quality that easily reflects Bush's attitude toward foreign policy." 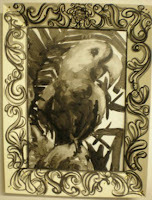 Also included are a series of sketches of animals drawn in my residency behind the scenes at The Baltimore Zoo. Opening Tuesday, May 12, 2009, 6-8 p.m.